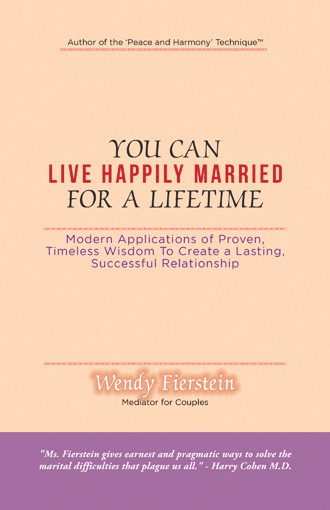 Palisadian Wendy Fierstein wrote a 186-page book on how to have a happy marriage for a lifetime, which was published by Balboa Press and released in September. Titled You Can Live Happily Married for a Lifetime: Modern Applications of Proven, Timeless Wisdom to Create a Lasting, Successful Relationship, the book is the culmination of 30 years of study in communication, psychology, neurolinguistic programming and Qigong. Fierstein also studied mediation through the Los Angeles County Bar Association. While there are numerous books on this topic, Fierstein’s book is written in easy-to-understand language with examples from her years of couples mediation. She points out, for instance, that when one spouse is feeling attacked verbally, that spouse’s reaction can escalate to an argument, or calm the situation down. Many of us know the old “story” about the husband who has a terrible day at the office. He comes home and begins complain- ing and screaming at his wife over some imagined fault of hers. She, in turn, yells at the kids, who then proceed to kick the dog. Anger, also known as “an adult temper tantrum,” makes it impossible to accomplish anything positive. When we’re angry we tend to speak first and think later. It’s best to diffuse the anger before speaking. And recognize that when you hurt your spouse, you also hurt yourself. “Taking your frustrations out on your spouse has consequences: it chips away at your relationship,” Fierstein writes. The book covers marriages that are fairly new as well as those that have lasted for decades. Everyone can find themselves in these pages. As I was reading the chapter that covers the emotional differences between men and women, I went “oops,” realizing that I was sometimes guilty of “nagging,” as men call it. I was trying to get my husband to live a healthier lifestyle. I, selfishly, want him around for a long time. Of course, my approach was not working. Fierstein’s book will help me, along with others who read it, to recognize little things we don’t even realize we do. The book is available at Amazon.com (and the Diesel bookstore in the Brentwood Country Mart). The trade paperback is $13.99 and Kindle is $3.99. Visit WendyFierstein.com for more information.